I decided that I only want toys for my birthday from here on out. An electric bass guitar is my first toy request! 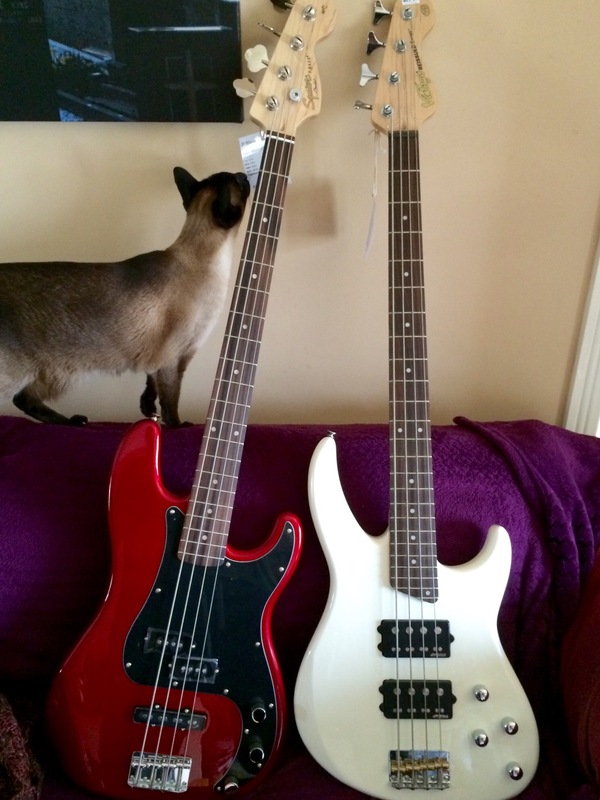 Fender Squire P-bass or the Vintage Reiisued V90? Yes, I have to remember a new number for the next year! Hehehe. Lokii is the Siamese boy, yes. I went back through the comments and saw where you mentioned it was your birthday the next day. That explains all the cake stuff I couldn’t figure out. I wish we lived close by, I would make you a grand cake and do up the decorations for a youngster like you. I can’t do as good as Emily of course, but I make up for it with slathered deep icing and I like to mix icing in swirls so you get a different taste with each bite. Love and hugs. I’m more grateful for the thought – back to the diet tomorrow! I’m not vain but I can’t fit in my clothes right now – need to get rid of the spare tire. Naw…keep the beer and get rid of the garters !!!! Happy belated! I missed the references to it completely… I agree, toys are wonderful, but personally, I go for gift cards to the fabric shop, so I can go bonkers shopping without guilt. Cool toy! I hope I get to hear a recital! I would run when anyone picked up a guitar too, at least an electric one. But I am an old classical fart, what can I say? Everyone deserves a happy birthday. Yes, very nice basses. I have a US made Strat. Fenders are such beautiful instruments. No bother – it’s not like it was a big one 🙂 I was wondering where you went to! LOVE YOUR CAT!!! I miss monkey cat very much. I grew up with Siamese cats and seeing yours made me want another one.